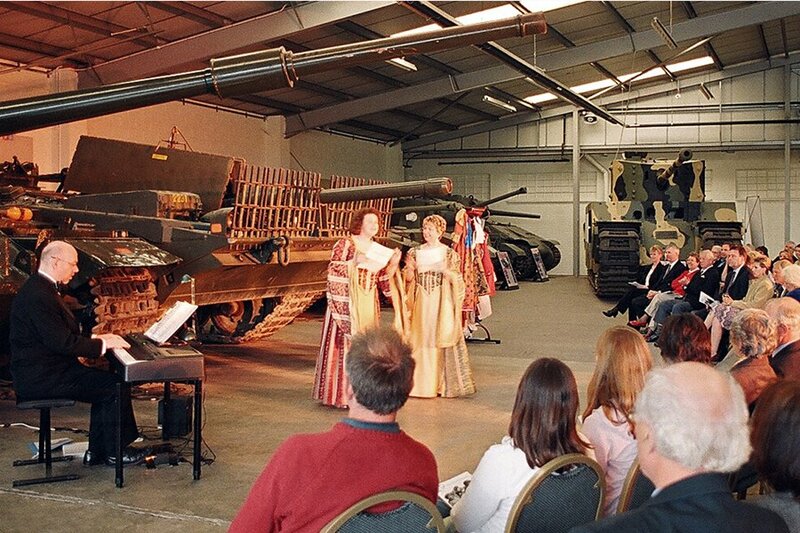 The Tank Museum Bovington commissioned Hatstand to create a unique performance, bringing live opera to the very heart of the Museum. In response to the Museum’s impressive collection of tanks and military vehicles, Hatstand created a show with innovative, illuminating and just plain irreverent links between the world’s greatest tanks and opera’s greatest hits! Three months before the performance, pianist Jeremy and singers Kirsty and Toni had the unique chance to crawl, lounge and spill over the tanks as part of an advance publicity photo shoot. Now tanks are not exactly spacious inside, and Toni and Kirsty had real problems getting in and out of the tiny hatches, especially in high heels and long dresses. Since the Museum was open to the public at the time, we got some very strange looks indeed! The highlight of the day had to be when we moved outside to a Chieftain tank all revved up and raring to go. Helmets on, we looked ready to drive it, but eventually it was Jeremy who got to ride the tank back to its garage, straight over the top of a bank they call the Knife Edge. This was quite an honour, as the group in the tank before us had travelled all the way from the USA just to do the same ride, and had planned it over a year in advance. As we toured the Museum to research the collection and possible musical links, we didn’t expect the collection to be quite so fascinating and engrossing – soprano Toni had to be dragged away at closing time! Back in the office, we traced the history of the tank from its first appearance in the trenches of WWI to the more modern machines we were to perform amongst in the hall. The resulting selection of music was moving, inspiring and down right eclectic, including high opera and haunting English song, plus the classic ode to a tank, Flanders and Swann’s “The Armadillo”. The event was such as success, we returned the following year, adding two Graffiti Opera workshops for local schools. 250 local youngsters rattled the gunbarrels for our “Well Wicked Opera” workshop, and 50 secondary children recreated a poignant sound picture of a World War One trench, all the more evocative when surrounded by the tanks themselves. We also integrated the chance to handle genuine WWI artefacts into the workshop, a true multi-sensory experience. If your museum needs an unusual event to bring its exhibits to life, call us on 01252 511 762.